Trump Murdering Refugee Children which is like Killing the Baby Jesus? This is blasphemy of the first order. Not anything that President Trump has done. But by leftist Democrats who are excoriating President Trump as murdering refugee children on the border. Latino-communist invaders are neglecting children to the point of death and then crossing the border illegally to hand them off to the border patrol to die. Democrats are then using this as a publicity stunt to cast border guards and ICE as satanic killers over the deaths of these children when there is nothing they could have done to prevent them. They say that makes Trump the murderer, and if Baby Jesus had come to America’s border, Trump would have killed him! I love taking liberal logic, meant to slander Christians by falsely conflating their idea of Jesus with the truth, and shoving it back down their lying throats. Democrat mayors and governors break American law and then make anti-American law, and then when citizens are murdered by their illegal aliens they get in front of cameras and lie through their teeth that they are upholding laws. These people condemn Trump for white lies while they tell the blackest of lies. One of the first clues that what they are saying is false is when atheist socialists tell Christians what Jesus would do as if they are the moral authority. By making the false equivalency of illegal border crossers being the same as Jesus’ family going to Bethlehem or fleeing to Egypt, liberals create a false paradigm by which to level false accusations against President Trump as being a heartless xenophobe. The people who have the lives of sixty million babies murdered in the womb on their souls believe they have the moral authority to condemn President Trump for protecting the border from invaders. 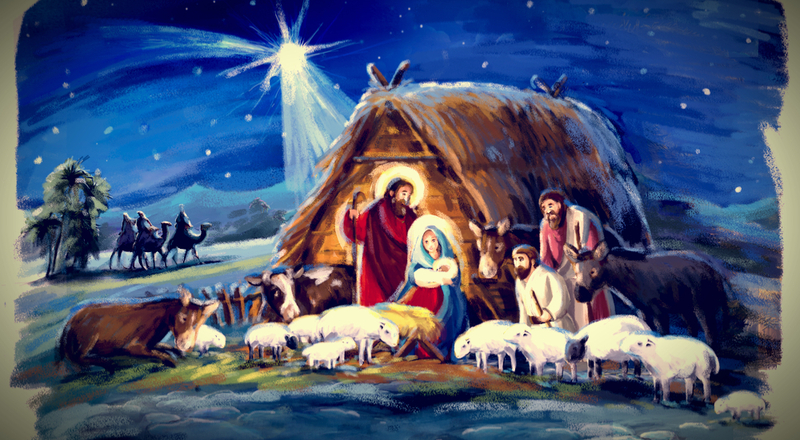 Where is their proof that Mary and Joseph went sneaking across the Egyptian border past the guards? They did no such thing, unlike Latino-communists sneaking into the USA to steal jobs, dodge taxes, and avoid medical examination! If the left wants to condemn Trump for the deaths of two children, then they are guilty of committing genocide along with their communist brethren to the south. They are also guilty of “coyotes” who kill hundreds every year leaving them locked up in trucks in the desert, and guilty along with their drug cartels that murder thousands and enslave thousands more – and that’s just along the Mexican border. What about the thousands of Americans that are exposed to diseases who die of those contagions brought into this country by their illegal aliens and their children? And let’s not forget the thousands of American citizens murdered by criminal illegal aliens who sneak into America to escape justice in their countries, so they can commit more crimes in ours. Democrats boo hoo over murdered citizens but never hold the illegal alien criminals they invited into the country responsible for their crimes. They give them sanctuary and release them into the general populace to avoid deportation by ICE. But they blame President Trump for any illegal alien child that dies from their parent’s neglect. These criminals could have been deported by ICE but for Democrats protecting them. Democrats pretend to care about a single child that dies in ICE custody, not because they care about loss of life, but because they can use it to vilify the President, the border patrol, Republicans, and Christians. These are the people who don’t care about the millions of babies slaughtered in the womb and sold for body parts because they profit from it. These are the people who let black gangs kill each other along with innocent bystanders in Chicago because they profit from it. These are the people who allow drug and human traffickers to cross our border unimpeded because they profit from it. They are not fooling the 60% of the population with moral intelligence. Whenever a cop or citizen is killed by an illegal alien, Trump Republicans say build the wall to protect Americans. Whenever a criminal is turned away at the border, Democrats say it is immoral to stop anyone from freely entering the country including criminals and terrorists. Only one side is morally right. Alexandria Ocasio-Cortez was declared “the new face of the Democrat Party” by the head of the DNC. When a mentally retarded person is elected and becomes the face of the Left then you can see why stupid people shouldn’t vote. Democrat leaders from Pelosi on down to Ocasio all suffer from an extreme lack of intelligence, knowledge, and morals. The Democrat Party is mentally and morally bankrupt, yet they command 40% of the American population and 100% of illegal aliens. These people own crime and corruption in America. Democrats never relate all the facts but only enough to support their false assumptions. They keep saying just building a wall won’t work as if that’s all that will be done. “19th century technology won’t solve a 21st century problem.” Well no sh*t Sherlock! How stupid are Democrats to think Americans are too stupid to think of more than just a concrete wall people climb over, tunnel under, or break through? Just like the walls they build around their own houses, Democrat congressman also employee guards and electronics in addition, but they first build a wall because walls work! What is wrong in American politics today? The false assumptions that Donald Trump is a racist Nazi xenophobe and Barack Obama is a saintly genius. The problem with America today is that 40% of people not only believe these assertions to be true without evidence, but in the face of evidence proving the opposite. They take it all on their faith in government. Some Republicans say Democrats need to see the data on the effectiveness of a border wall. These fools know the data which is why they are against the wall. They profit from the criminals and drugs that pour across the border illegally. Take toy guns away from children rather than stop criminals. Take money from people for climate change. Import foreigners to unmake America. Democrat’s approach to “compromise” with Trump on the wall is the same as Moslems “compromise” with Israel to exist peacefully. Israelis begin negotiations saying they will live in peace with Moslems when they stop attacking them. Islamists begin negotiations saying they will live in peace with Israel when it is destroyed, and all Zionists are dead. How do Israelis begin negotiating when Arabs hold that as their only goal? How do you negotiate with people who want to kill you to be less dead? Likewise, Democrats negotiate from the endgame of wanting the border to remain open, so they can continue to import their criminals and slaves. If the border is restricted in any way, then their drugs and criminals no longer have easy access into America. Only a few conservatives will bring out these facts against all those people who want to compromise with the left. That’s why we watch FOX News and listen to Rush because the hysterical leftwing media spews nothing but poison, lies, and propaganda. They are so insanely arrogant they believe their own lies to the point they condemn the righteous for not falling for them and praise the few on the right still fool enough to do so. These people are obviously working for the left as inside agents. Democrats will never play fair and you can bet there are already Democrats stuffing boxes with fraudulent ballots storing them in closets and the trunks of their cars in preparation for 2020 as well as enlisting illegals to cast criminal votes. President Trump not only needs to close the border, but to close the voter fraud loopholes that will allow Democrats to steal back power.